The second week of the 2016 tennis season is over with the Australian Open now on the horizon. It was another withdrawal-heavy week in Sydney with three players pulling out pre-tournament and two more during the actual tournament. It paved the way for an unexpected final between Svetlana Kuznetsova and Monica Puig with the former producing a special performance. Hobart’s draw held up remarkably well and featured some quality matches. Here’s a look back at some of the highlights from this week on the WTA tour. Svetlana Kuznetsova was a surprise winner in Sydney… I say a surprise winner, but you never quite know what you are going to get with Sveta. When peak Sveta does show up though, she’s a match for anyone on the tour. Alizé Cornet won her first title since 2014, losing just five games in her last two matches having been pushed all the way in her second round match against Veronica Cepede Royg, a match that lasted seven minutes shy of three hours. I’d be surprised if we see better match stats all year. 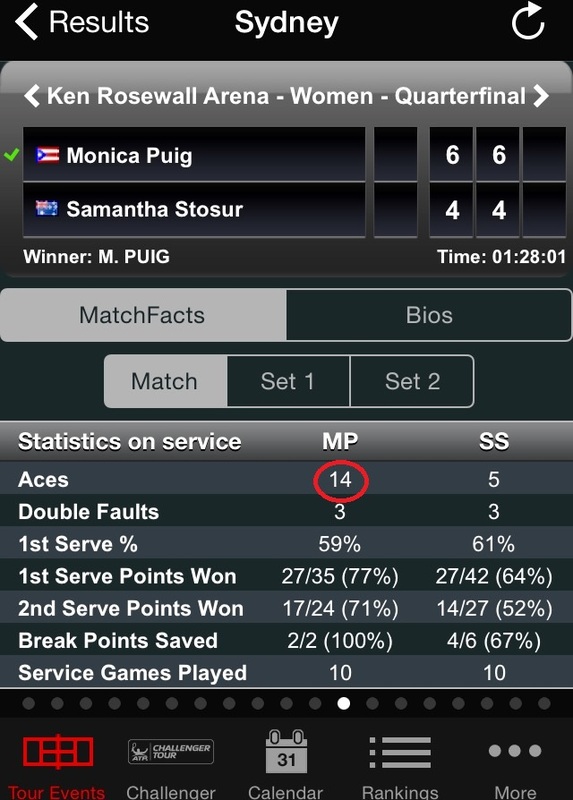 Puig had an incredible serving day in the quarter-finals against Stosur… she dropped just three points on her serve in the second set and was 8/8 on second serve points. 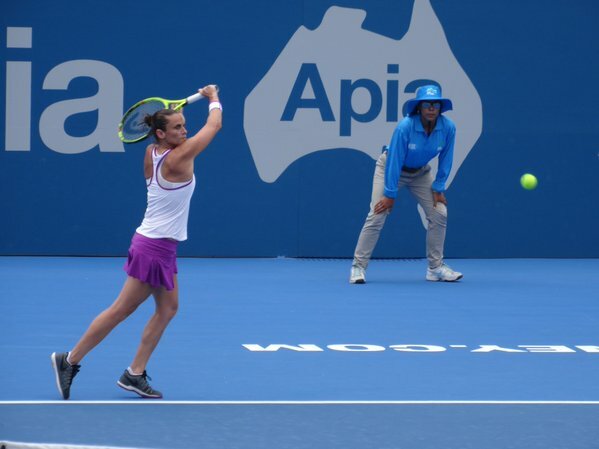 The Jankovic-Errani match in Sydney was… eventful. Thanks to Tom (@TennisZealot on Twitter) for his post from Sydney. ICYMI, it’s well worth a read HERE. A couple of Tom’s photos are included below, of which more can be found in his guest post and on his Twitter page. Jimmie48 is already in Melbourne, getting some great shots for Women’s Tennis Blog of the top players practising and from qualifying too. This point from the Cornet v Cepede Royg match in Hobart was pretty damn amazing. 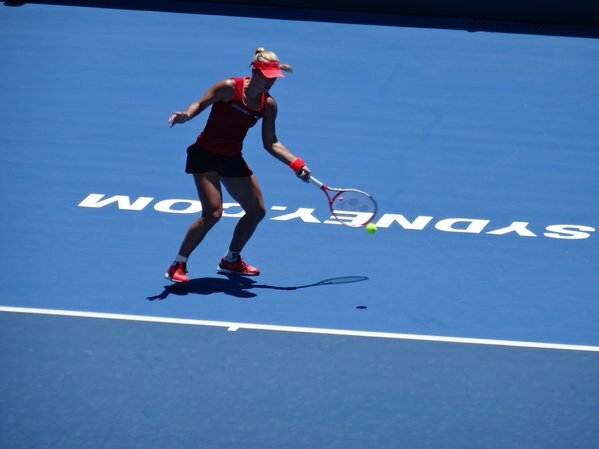 This was another good one from Hobart in the Bouchard v Van Uytvanck match. Here’s a happy-looking Kuznetsova after her first round win..
… And Kuznetsova after winning the title. Puig’s reaction to winning her quarter-final against Stosur showed how much this win meant to her. Here’s her post-match interview on court. Racket Rally is back! The Moo’s Tennis Blog league is still there and i’m hoping to do a post before Monday with my portfolio choices. A shout-out to the Hobart YouTube account which has been posting full match highlights all week. It’s not the first year Hobart has done this but it is one of the very few tournaments to do so. Even better, there also some decent match highlights (about five minutes long) if you haven’t got time to plough through the full highlights. Five thoughts with Belinda Bencic from the Sydney International website (click HERE). I liked her comment about dealing with negative social media and how she rises above it. 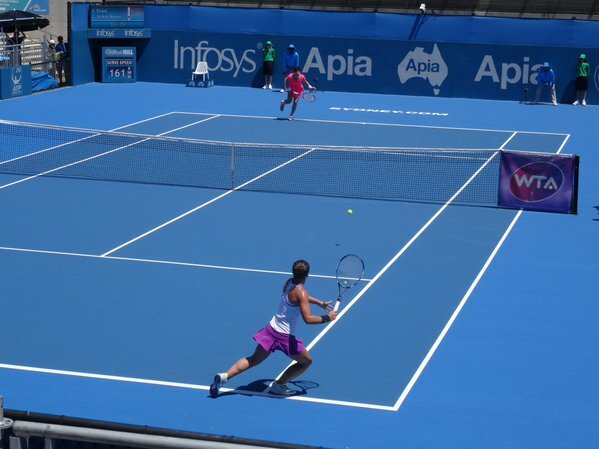 January 16, 2016 in Hobart, Match Points, Sydney, WTA. She’s great haha loved her press conferences. This was Vintage Sveta in the final at Sydney,the angles and down the line winners were just a Joy to Watch. Two very worthy champions here in Sveta and Alize. In both cases it’s great to see them coming back to something like their best form after something of a lull in their careers, although Sveta did win the Kremlin Cup at the end of last year. Both the runners-up did very well too, especially Monica for whom making this final must be a career best for her so I hope she doesn’t get too disheartened at having been beaten so decisively. Hobart seems like a lovely tournament; I’ve noticed that they put the full videos of completed matches on their website for people to watch. I wish other tournaments did that. The only downside for me was Heather (Watson) and Johanna (Larsson) having to play their match at midnight, which made it very hard for them (and especially Heather, who’d played earlier that day) to play their best tennis, but maybe it’s unavoidable with the rain delays and the necessity to finish the tournament within a week and in time for the AO. BTW, a small correction of fact if I may; Alize last won a title in 2014, at Katowice in Poland. Hobart looks like a great tournament. It’s just a shame it gets somewhat overshadowed the week before a Slam and with Sydney too. I just can’t keep up with everything!